With four months remaining, the Catholic Ministries Appeal has exceeded the 80-percent mark toward its $6.725 million goal. According to Colleen Brade, CMA campaign manager, the 38th-annual appeal had garnered $5.5 million in contributions and pledges from diocesan Catholics as of Jan. 30. That figure represents nearly 82 percent of the overall goal. Also by that date, 18 diocesan parishes had surpassed their individual goals, and another 12 parishes had achieved 90 percent or more of their goals. Campaign proceeds fund more than half the diocesan budget, fully or partially supporting programs, services and ministries around the 12-county Diocese of Rochester. 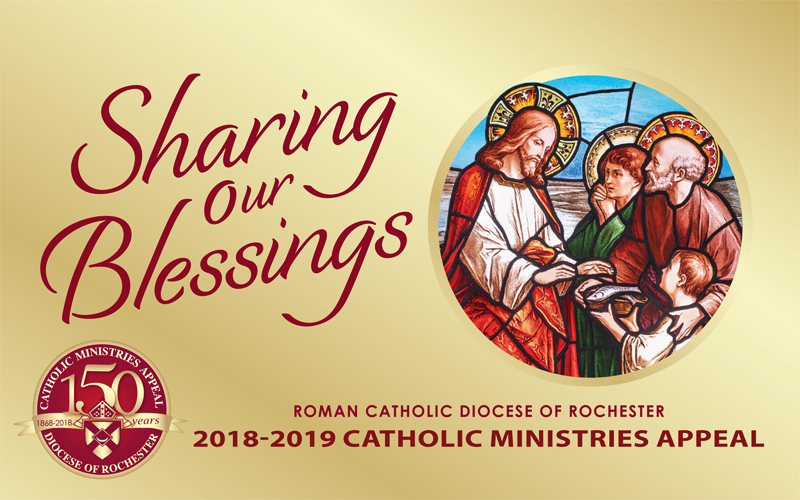 The theme of the 2018-19 campaign, which began this past fall and will conclude May 31, is “Sharing Our Blessings.” An informational video can be viewed at https://www.dor.org. Contributions may be made by mail using parish-provided envelopes or online at https://www.dor.org/giving/catholic-ministries-appeal/. Checks payable to the Catholic Ministries Appeal, credit cards, electronic-fund transfers and appreciated securities are all accepted. Donations are tax deductible. For further information, contact Brade at 585-328-3210, ext. 1326, or colleen.brade@dor.org.